Don’t you just adore apples? We’ve just enjoyed a brief trip to Tasmania, to visit fellow organic orchardists and friends Matt and Coreen from Our Mates Farm, amongst other things. Being apple season, on the Apple Isle, we were of course surrounded by apples. We’re always on the lookout for locally grown, certified organic produce wherever we go, and to our great delight, we didn’t have too much trouble finding some. We also visited the apple museum at Willie Smith’s Apple Shed, in Grove. It’s probably a bit hard to read the poster explaining its history (try clicking on it to enlarge it), but the apple museum is very close to the old Grove Research and Demonstration Station, which was an important part of apple R&D in Australia. It’s funded by local growers rather than the government these days, and it continues to house Australia’s biggest collection of heritage apple, quince and pear trees. The most fun part is the amazing apple display in the museum. There’s space for more than 390 apples, and each year fresh specimens of the different varieties are put on show. It’s wonderful. We resisted taking photos of ALL the varieties (it was tempting…) but restricted ourselves to (a) the varieties we’ve planted in our heritage apple orchard, (b) varieties we’ve heard of but never seen before, and (c) varieties whose names were just too cute to leave out! Honestly, you couldn’t make these names up! Apart from being fun to look at (if you’re apple nerds, like us), it’s also an important reference collection. We only managed to find one of the heritage varieties that we’ll have for sale for the first time this year through Carr’s Organic Fruit Tree Nursery. Well, a version of it anyway (we’re selling Democrat tree and this is a slightly different cultivar called Democrat Early). And we thought we were doing pretty well with 25 varieties of apples for sale in the nursery! We’re especially chuffed that we’ve managed to have 18 different heritage varieties on offer in our first year, including some very unusual varities you may not have heard of, like Roundway Magnum Bonum, Bess Pool, and Elstar. But the bar has definitely been set higher for us now, particularly as so many of these lesser known varieties look so delicious! Hmm, wonder if we’ve got room for 390 different apple varieties…. … and sometimes they’re pale? These two examples are both from the same trees at our farm (in different years). So, what’s the difference? There are a few factors that determine the final colour, and the main one is the weather, but maybe not what you think! Hot weather can bleach the colour out of the apples, and in fact we need cool nights and mornings for the apples to turn a lovely dark pink. However they also need a certain amount of regular sunlight hitting the apple, so if you have a dense leaf cover on your trees, the apples that grow in the shade under the leaves are also likely to be pale. This is one of the reasons why you might choose to do a bit of summer pruning on your apple trees, to reduce the density of the canopy and allow sunlight to penetrate the whole tree. But having said that, this is mainly a strategy used on commercial orchards to get better colour in apples, because they’re under pressure to provide uniform looking “perfect” apples. Most home-growers don’t care so much how their apples look as long as they taste great, and so are less likely to prune for cosmetic reasons alone. 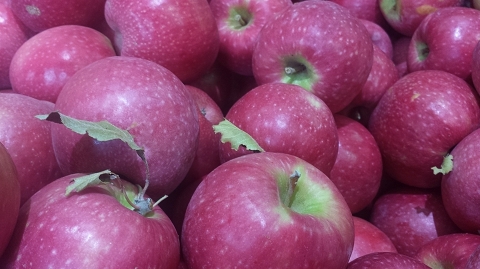 The last thing that may affect the colour of your fruit is the cultivar (or specific variety), as there are a few different variations of Pink Lady that have a different colour profile. 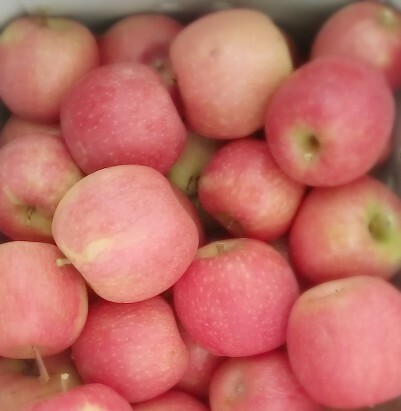 For example, Rosy Glow is a much darker pink colour compared to the more traditional Cripps Pink (the apple most commonly known as Pink Lady), for example, but they are still sold as ‘Pink Lady’. Do you have apple trees? They’re one of the most common fruit trees found in backyards, so we’ve gathered all our apple-specific growing tips into a single online course called Grow Awesome Apples. Is rain good for fruit? Like everything in farming, the answer is complicated, and depends on lots of different variables, so let’s break it down a bit. 1. Trees like rain better than irrigation water — up to a point! As a gardener, you’ve probably noticed how “perky” your garden looks just after rain. One of the reasons (apart from the leaves being cleaner) is because the rain carries dissolved nitrogen which is easily absorbed by the plants, giving them a nutritional boost. Too much rain, however, and the soil can become waterlogged, creating anaerobic conditions, which actually stops the plants’ roots being able to take up nitrogen! The other advantages of trees receiving their water from rainfall (rather than irrigation) are that the entire root system gets water (rather than just at the point of water delivery), and if you’ve been keeping your garden on rations due to dry conditions, they just love the opportunity to get their fill of water for a change! 2. Rain can trigger fungal disease. One of the biggest pest and disease risks in an organic farm (or garden) is fungal disease, and nearly all fungal diseases are triggered by wet conditions (at the right temperature). In general terms, the more rain, the more fungal disease. This risk is highest at the beginning of the season (i.e., at flowering time in spring), and then gradually decreases as the season progresses. During autumn, if the summer has been generally dry and there is not much fungal disease around, the risk of a new fungal outbreak is relatively low. 3. Rain can cause physical damage to fruit. This is very specific to the type (and even variety) of fruit. For example cherries are particularly vulnerable to splitting from the rain, and some varieties of apricots also split easily. Hardier fruit like apples and pears, however, rarely experience physical damage from rain. 4. “Hard” rain can damage all fruit. Storms that bring rain often also bring hail, and that can be completely devastating to all fruit. Hailstorms are very random and localised, so it”s pretty much the luck of the draw with this one, though if you live in a hail-prone area, netting can definitely be your saviour. All fruit are vulnerable to hail damage, including apples, pears, plums and quinces. 5. Rain is good for the landscape. When you’re trying to grow food in an arid landscape (as we are), the general impact of rain (as long as there’s not too much, or too quickly) is generally FABULOUS! It fills water storages, keeps the bush alive, helps to sustain our farming communities, and helps backyard fruit growers maintain their own food security. We love it….except…. when there’s too much! If rain becomes flooding and the soil becomes saturated for too long, it can lead to ALL sorts of problems! Anaerobic soil conditions, trees dying, waterborne soil disease, nutrient leaching, dams breaking their banks, and the list goes on. We’ve seen it before when the drought broke in 2010/11. 6. Rain is good for mental health. It’s a generalisation, of course, but very often rain can be a huge relief to farmers and others in the community, especially if it is relieving the pressures of trying to farm in a dry landscape, though as you can probably see from our list, it totally depends on the amount of rain, and the context! Regardless of the timing of rain within the fruit season, it’s important to make sure your soil can act as a big “water storage tank” when it rains. As well as building really healthy soil (which is good for both water storage and drainage in your soil), techniques like swales and keyline (covered in this short course) can make a huge difference to how well your soil will store rainfall. Author KatiePosted on March 15, 2019 March 15, 2019 Categories apple, apricot, cherry, Disease control, farm, fruit trees in spring, Grow Great Fruit, grow your own food, Home grown food, pear, Permaculture, plum, Soil health, Weather and fruit growingTags #growgreatfruit #organic #growyourown #homegrown #treehealthLeave a comment on Is rain good for fruit?